Comedy skit performed at the 2001 Edinburgh Festival. A person calls for roadside assistance after breaking down on Watt Street in Ware, Georgia. Dispatcher: Hello... are you there? D: Can I help you? D: What can I help you with? C: My car has broken down. D: What seems to be the problem. C: Well... my car won't work. C: There's no need to be like that. D: Sorry. What has happened? C: I was just driving along and the car died. C: Stopped working. Conked out. Kapput! D: There's no need to be like that. C: Sorry. The car has stopped working and I need roadside help. D: Of course. That's what we do. D: I just need some details. Where are you? D: I mean what town. D: The place you've broken down? D: The name of the place you standing right now? C: I am in Ware. D: What are you asking me for? C: I'm not asking you, I'm telling you. D: Well go ahead and tell me. D: Look do you actually own a car? C: What kind of question is that? Of course I own a car. And it's broken down. D: Where's it broken down. D: Look, when the repair man comes out to your car, where do you want him to go? C: Now you've got it. D: Ok. Do you have sat nav? D: When your sat nav finds the car, where does it say it is? C: I'm not asking you, I'm telling you! D: Fine. Forget the town. D: I'm mean, let's move on. D: What's the name of the street? C: How did you know that? D: You're not telling me anything. C: I'm telling you everything. Now I'm on Watt Street. C: I just told you. D: The name of the street? D: So, now we're getting somewhere. Spot On Street. Now what's the name of the town? C: No, that's the name of the street! D: So, Yes Street in what town? C: No, Watt Street, Ware. C: I'm not asking you! D: Ok, this is getting us nowhere. D: Please don't start that again. C: Ok? You've got it? D: Say I am driving to you what sign should I look out for? D: When I'm driving to you? D: Oh, let's not start this again. C: No... the car won't start. That's the problem. D: Is there a sign on the road? D: What does it say? D: The sign on the road. D: READ OUT THE LETTERING ON THE ROAD SIGN. D: YES, ON THE STREET. D: THE STREET YOU'RE STANDING ON! D: Oh, I can't take this any more. I'm going to tell the repair man whatever you tell me. C: Excellent. This has taken a very long time. D: Where is the town. C: Do you have difficulty understanding English? C: Where Town. Me on phone. You listen. C: Yes, that's the street! D: Ok, you are on What Street in Where. C: Now that's the first thing you've said right. D: I don't even know what I'm talking about! C: But that's perfect - Watt Street, Ware. D: So lastly, your name? C: Annie / Mike (depending on actors). D: Ok, Annie / Mike wha... Do you have a surname? D: Annie Place / Mike Or... Any Place? / My Car? Goodnight!!! 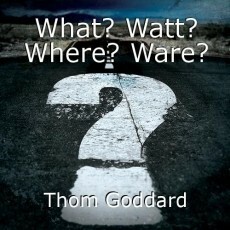 Note: For performances in the UK the road is Watt Street in Ware, Hertfordshire. Does the Moon Cycle Affect How Quickly Milk Goes Bad? This page was created in 0.4643 seconds.